The prize-winning MX series was a winner in more ways than one. Quite apart from its stunning looks, it was packed with Bang & Olufsen technology to give you breathtaking picture quality. The MX3000 had a 51cm flat-square picture tube, giving you a great view from almost any angle. It wouldn't fade away in strong sunlight either, thanks to the contrast screen which kept the picture bright and clear. And, with automatic colour tuning 50 times per second, the colours were always natural and true to life. A superb picture needs top-quality sound. You obtained both with the MX series. The special Log Line speaker system gave you extraordinary lifelike sound reproduction from very compact speakers. Your stereo videos gained an extra dimension from the stereo width adjustment, which provided a wider, fuller sound image. And to receive stereo TV broadcasts, all you'll need to do is install a NICAM decoder. There's good news if you're planning a round-the-house TV, video and music system too - the MX3000 could team up easily, and also gave you an extra pair of speakers on demand. Are you planning to receive the myriad of entertainment options which satellite TV will eventually offer? Just add Bang & Olufsen's parabolic 'dish' antenna and the MX3000 is all set. You'll also find the digital search and fine-tuning system invaluable when so many TV stations are competing for your attention. The system was first introduced on the L and LX TVs; working on the same principle as an electronic tune radio, it was a great success. 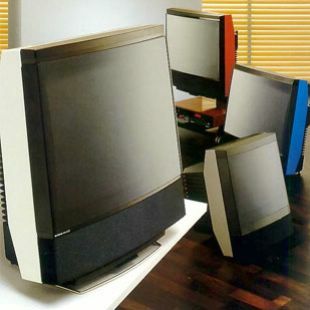 If you add to your Bang & Olufsen TV with a B&O VCR, or broaden your horizons and go for the complete round-the-house system, you'll still need just the one neat remote control. The Beolink 1000 remote control unit talks to tape recorders just as easily as it does to video recorders. You won't be short of connections either - the MX3000 can accommodate a personal computer, video games, headphones and a loop amplifier for the hard of hearing.